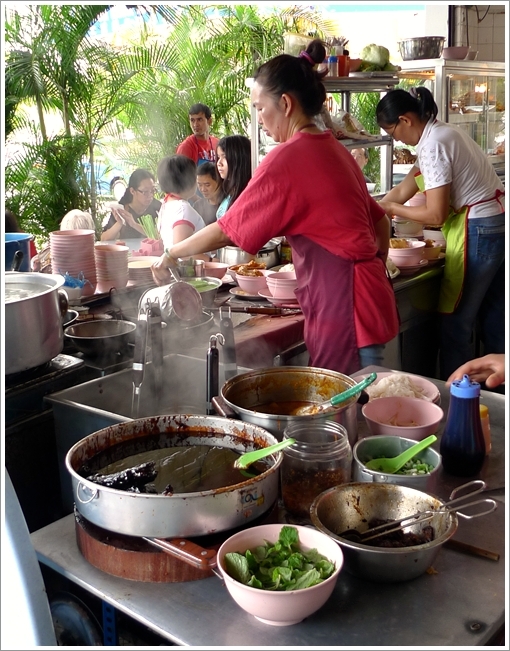 Hard at work; the ladies of Foo Kwai’s curry mee stall in a buzz of activities in the mornings. Just don’t go in a severely famished state. The wait can be slightly daunting. We waited a good 30 minutes. Ahhh…. to be back in good old IPOH for the long weekend (thank you PM?). Breakfast in Ipoh is a delightful endeavour; almost the most important meal of the day. If you’re not fond of the humongous crowd at the dim sum restaurants around Ipoh (it’s mad on a weekend’s morning, so be warned), then you can choose from the many other selection of hawker fares. For me, a good breakfast in Ipoh is constituted from either a toast, eggs and WHITE coffee combination, OR a noodles affair with various accompanying sides eg. 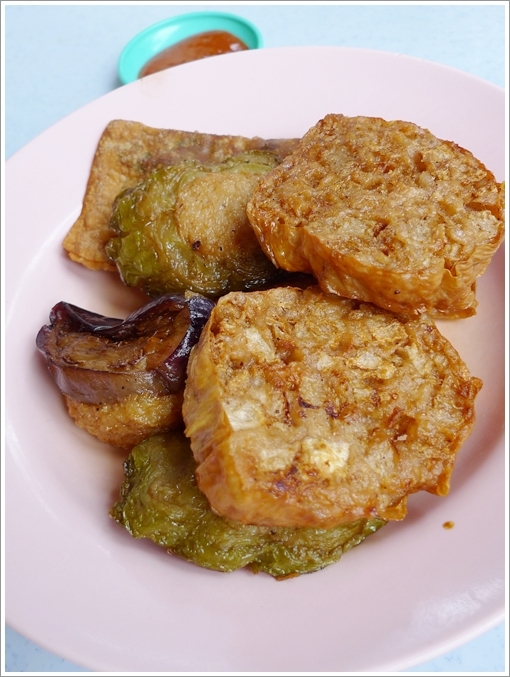 stuffed fish paste (yong tau foo or yong liew). And the list of GOOD places for ‘yue dan fun’ or fish ball noodles (literally) in Ipoh spans long and far. Scattered all around Ipoh, you can actually find hidden gems in exclusive residential areas unknown to the outside community, but with a strong fanbase formed from the local community and the random epicureans willing to travel far and wide for a gastronomic sensation. And Foo Kwai in Bercham might just be one of them …. Freshly fried Yong Tau Foo from the wok, and pieces of generously-stuffed vegetables and beancurd with the bouncy fish paste. Mum said I have eaten here before some years ago. Or maybe more than a decade’s worth of hiatus (inner longing? ), but I have absolutely no recollection of this place. A corner coffee shop facing the main road of Bercham; you probably will zoom by and won’t notice its existence unless you’re astounded by the sheer number of people there in the mornings. And on weekends and public holidays, you might have to share a table or stand around like vultures hoping that the others will slurp on their noodles and coffee with a faster pace. Just that, the wait for the food can be somewhat relentless. Half an hour’s worth, for us that morning. The stuffed bitter gourd (green), brinjal (purple) and the pieces of Ipoh’s very own Sar Kok Liew (stuffed yambean) rendered the wait worthwhile. Modus operandi? Walk over to the counter, pick up a bowl and a pair of tongs then choose to your heart’s content. The fried items are ready to be eaten, but the noodles take time to be prepared. So if you’re on the brink of starvation, you can settle for a whole plate of fried ‘yong liew’ and eat there and then. But you should NOT miss their dry curry mee with char siew, chicken and/or cockles. Dark, caramelized Char Siew seated gloriously atop the plate of blanched lou shu fun (silver needle noodles) in a dry curry base. The curry noodles, or dry curry noodles are good bets if you’re prone to ordering something piquant to kick start your day with. Like yours truly. The dry curry gravy ain’t as thick as Yee Fatt‘s, nor as lusciouly rich like Nam Chau‘s, but still a notch above the usual soy sauce+dark soy sauce+half a spoonful of curry paste varieties sold elsewhere. But you shall NOT give their Char Siew a miss! From the first picture on the top of this post, you can see the pot of extremely black sauce with a few chunks of pork jutting out from the surface. THAT is a pot of GOLD. Of porky goodness, and sweetish, caramelized roasted lean pork cuts known as Char Siew. You may not like the slightly sweet taste of the Char Siew, but when paired with the curry paste, the combination of flavours actually gelled together pretty flawlessly. And of course, you can go for shredded chicken, cockles and I think even crispy roasted pork (siew yoke) to load up on the proteins. But I decided to go for the various ‘yong liew‘ instead; displayed in an orderly manner in the metal cabinet with glass display. And a good cup of ‘Cham’ (coffee + tea with milk) to cap the breakfast off. Blissfully done. 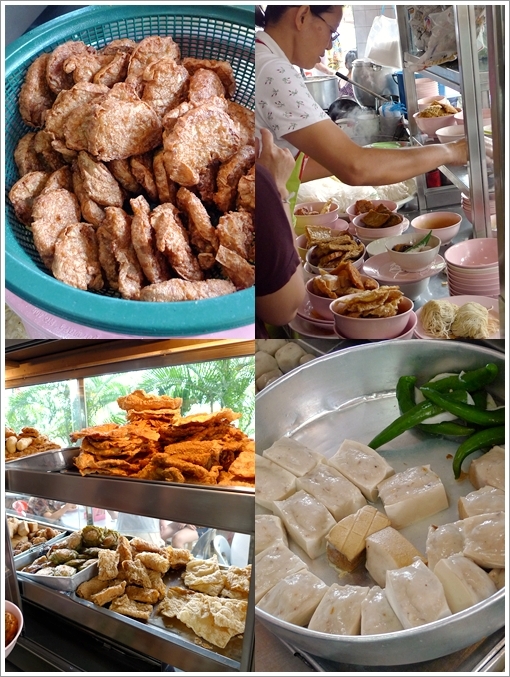 Go for the chunky Sar Kok Liew, and the many fried items. Good chunks of fish paste with a definite element of homemade rather than sourced from the generic (artificial?) ones. There was one fried dumpling with dried shrimps and Chinese chives (kuchai) within that was actually a rarity these days. 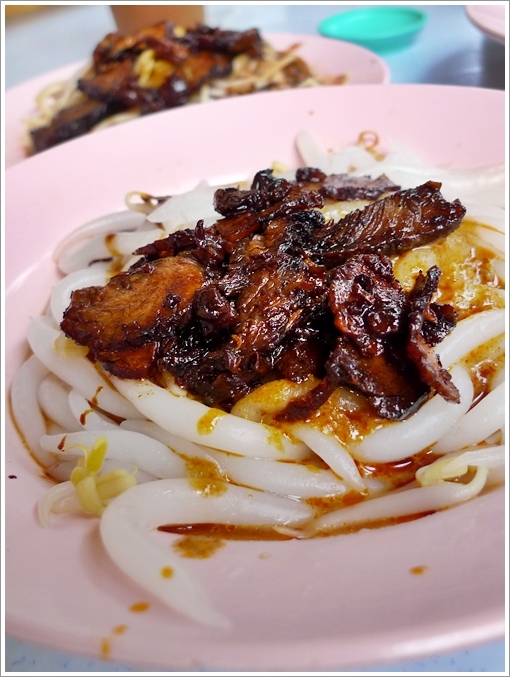 *Foo Kwai Restaurant also houses several other food stalls aside from this noodles option. There was an equally as interesting soy sauce chicken rice stall with various braised items, and another pan mee stall that also sells Chee Cheong Fun. Foo Kwai Restaurant. 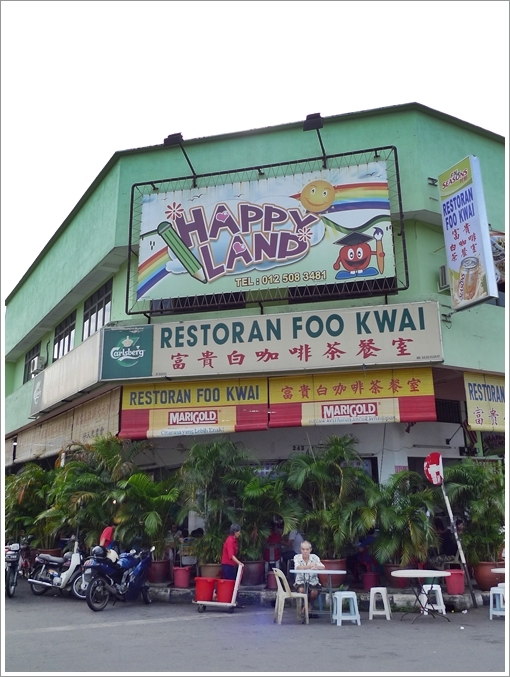 HAPPY LAND for the foodies indeed. And thus, this post officially launched Motormouth From Ipoh into a new year. Let’s hope that I can seek out the time to come back periodically and cover more delicious findings in and around Ipoh. Have a fruitful year ahead ……..
Taman Desa Kencana, 31400 Ipoh, Perak, Malaysia. Opens for breakfast until lunch daily. Off days not sure. *To find this place is quite easy. Coming in from Jalan Bercham (the main road) from Tesco Extra’s direction, just go straight until you reach the second traffic lights where you can turn right. Turn RIGHT at the lights and almost immediately turn LEFT. You will pass by the front of Ritzbina Restaurant (Lock Yun, a famous place for economy rice), Kah Seng Ipoh Tauge Ayam and Ambank (correct me if I’m wrong). Foo Kwai is next to Maybank, and directly opposite of Shell station and Proton showroom. Haha, nolah …. maybe you can go earlier or much later? 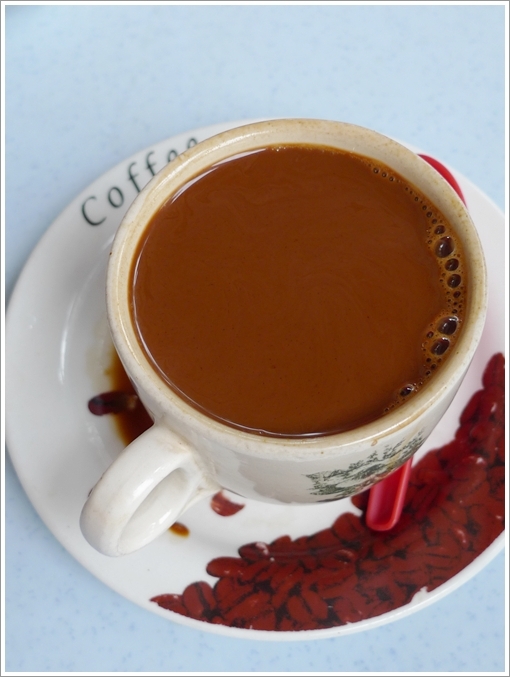 Yeahloh … especially when in Ipoh you get good dry curry version of sar hor fun or lou shu fun, then paired with good chunks of yong liew and then a cup of milk tea or white coffee to complete the breakfast. HEAVEN, I tell you. The one next to Maybank! IS IT THAT MAYBANK FACING THE MAINROAD..SAME ROLL WITH KFC? Yes pat. The same Maybank on the main road. Ah I miss those yong liew from Ipoh! Or Kampar even.. not many stalls in KL have good yong liew.. we should go for Puchong YTF one day!! Happy new year. wish you keep posting a nice food guide. Interesting food, I will go for it with my friends. miss the curry. Thanks for the wish. Just be early, or avoid the crowd. Aww, had this once two years back and I can still remember it. Love the dark charsiu! Yeah, very different and very homemade. Happy New Year too. Dry curry mee make me feel hungry. i wish i can go around ipoh to take a great taste from this meal. Yeah ….. indeed. The wait was worthy, and we had to wait long also for the noodles to be served. any idea which day is closed for biz? Sorry Richard, I have no idea.